Project Sekong 2014: Good boots are essential. I’m taking back an earlier recommendation. Years ago I a gave a strong recommendation to these boots, Sundowners by Vasque. The brand is now owned by Red Wing Shoes a Minnesota company but the boots have been outsourced to China and the quality has dropped. I'm on my third pair and each has been worse than the previous. Recommendation reversed! 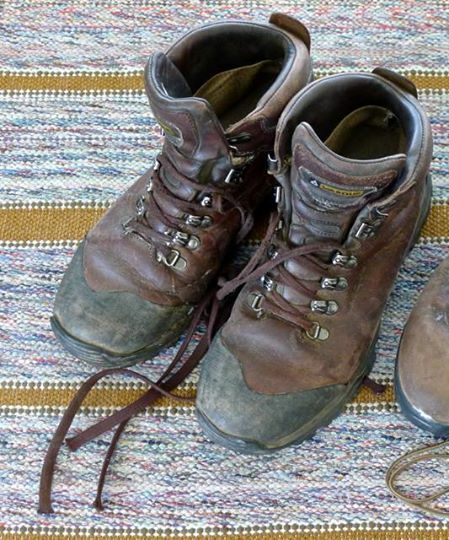 One piece of advice for those who are planning for work in the bush: spare no expense when you purchase your hiking boots and allow enough time at home to properly inspect them and break them in. Better to break in your boots than for your boots to break in your feet. Learn from my recent mistake. A few years ago I posted a blog touting my favorite boot: “Sundowners” by Vasque. (Once a “boot of the year” selection at a highly respected hiking magazine). Today, I’m rescinding my past recommendation and warning people: these are not your father’s Sundowners. They’re not even your older brother’s Sundowners. Red Wing Shoes, the current owner of Vasque, has permitted the ruin of a legendary boot. I was baffled when the new boots arrived and were clearly a mismatch for my feet. I had to return them and ask the company to rush me a replacement pair a half size larger. The replacements cost me over ten dollars in shipping and arrived too close to my departure to permit proper breaking in. Furthermore, side-by-side comparison of the new boots with the old revealed a variety of changes in both material and construction. The quality of the leather has dropped, the rubber toe shield is gone and the overall stitching is inferior. I put the shame on Red Wing Shoes who apparently bought a legendary name, cut the quality, and hope to enjoy good profit margins until they’ve milked their cash cow dry. I hope the public quickly catches on that the sun has indeed set on the Sundowners.